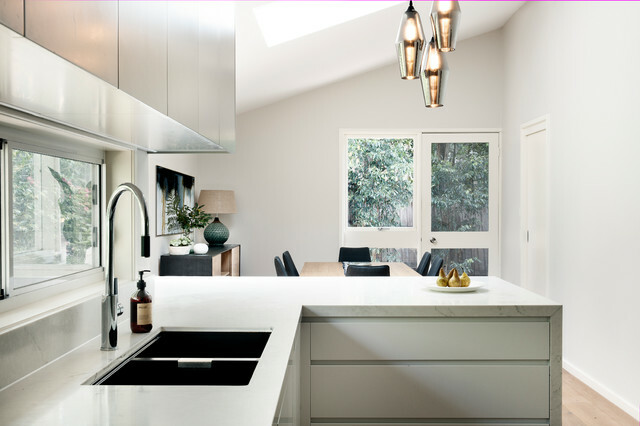 A contemporary kitchen and laundry renovation with butlers pantry in a mid-century home. Painted V-board panelling and mid-century style pendants area contemporary take for an updated look in this style of home. BriefThe clients wanted to update the look and layout of their kitchen. The existing kitchen was functional and reasonably sized, but it looked tired and lacked pantry storage. Initially, the clients were not sure about the style, colours and finishes they wanted, so I assisted them in their research. They wanted their kitchen to have a sophisticated look and favoured cleaned lines, whites and neutrals. It also needed to feel welcoming as the family likes to entertain.